ThorImageLS is used to control all of our microscope systems. 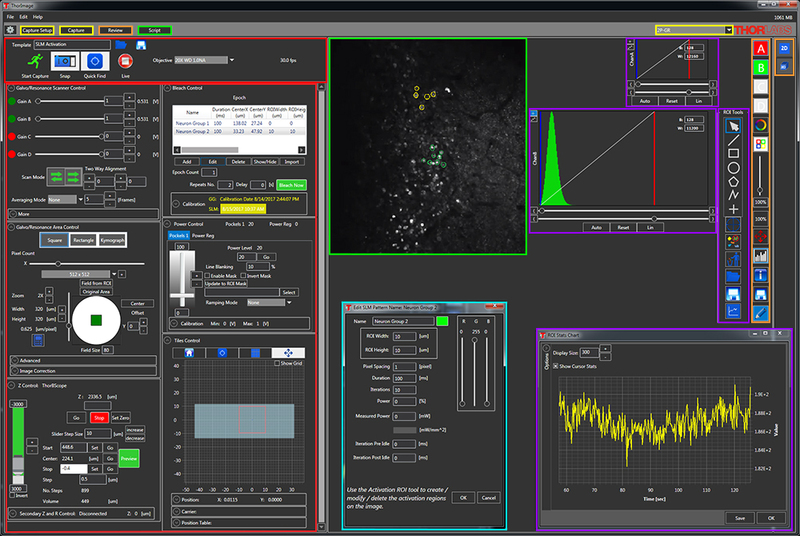 ThorImageLS software manages the activities of Thorlabs' Bergamo® multiphoton microscopes, Cerna® hyperspectral system, and confocal microscopes, as well as supplemental equipment, to acquire and analyze data sets. 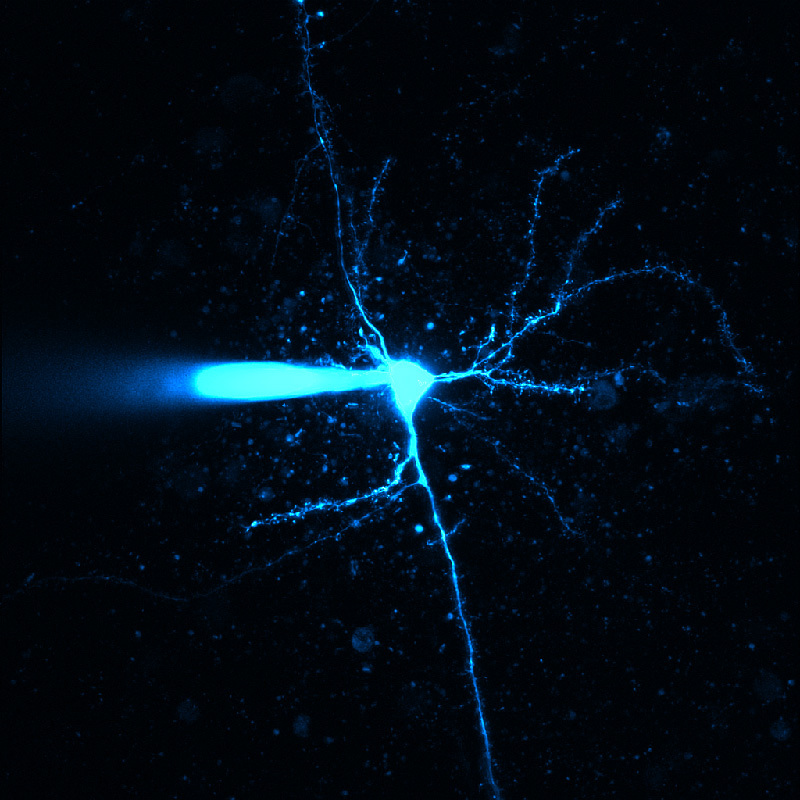 Version 3.1 has been developed by Thorlabs with a range of features and capabilities, including holographic optogenetics, deep physiological scans, large-area tiling, high-speed imaging, and multi-modal acquisitions. To explore the functionality of ThorImageLS, click on the images below or through the tabs above. 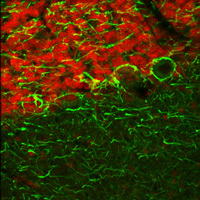 Top Left: Multi-channel confocal image of neurofilaments (green), glial cells (red), and DAPI nucleic stain (blue) from hippocampus cells. 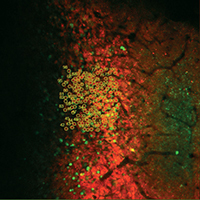 Bottom Left: Simultaneous photostimulation of 100 cells co-expressing GCaMP6f (green) and C1V1 (red). Provided courtesy of Lloyd Russell, Dr. Adam Packer, and Prof. Michael Häusser, University College London, United Kingdom. Top Right: Two-photon 3D image stack of thy1-YFP in a cleared region of the dentate gyrus. Provided courtesy of the 2017 Imaging Structure and Function in the Nervous System Course at Cold Spring Harbor Laboratory, Cold Spring Harbor, NY. Bottom Right: Coherent anti-Stokes Raman scattering (CARS, red), second harmonic generation (SHG, green and purple), and sum frequency generation (SFG, blue) image of a chicken heart. 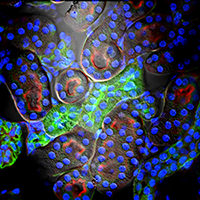 ThorImageLS streamlines the image acquisition and analysis process with a user-intuitive, feature-rich workflow. Control panels are designed so that the most important features are readily available and users can quickly set up their experiment. Panel layouts are completely customizable for different users or imaging modalities. All software features are easily accessible, providing a complete, self-contained software package without compromising ease of use. See the Capabilities and ThorSync™ tabs to explore the ways ThorImageLS can easily image feature-rich samples. See the Interoperability and Open-Source tabs for additional information. See the Capabilities and Interoperability tabs for additional information. To view ThorImageLS in action, see the videos in the Overview and Capabilities tabs. See the Capabilities and ThorSync tabs for additional information. Select one or more regions of interest (ROIs) to perform real-time calculations simultaneously with image acquisition. See the Capabilities tab for more information on other ThorImageLS capabilities. ThorImageLS is designed with a wide range of features to serve as one integrated imaging software solution; certain functionalities are described in detail below. For a complete list of software features, see the Specifications tab. ThorImageLS is provided as a complete software package, allowing acquisition of a complete XYZCT dataset. 3D volumes can be captured in x, y, and z, or tracked over time to study kinetic events. 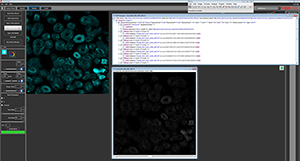 Independently, you can add a 5th dimension of information by overlaying multiple fluorophores or imaging modalities, all in the same software. The setup and acquisition process is designed to be simple and intuitive for even the most data-rich of acquisitions. Use one software package for a multi-modal image acquisition instead of switching amongst multiple software applications. Laser-scanned images can be simultaneously obtained with widefield images. 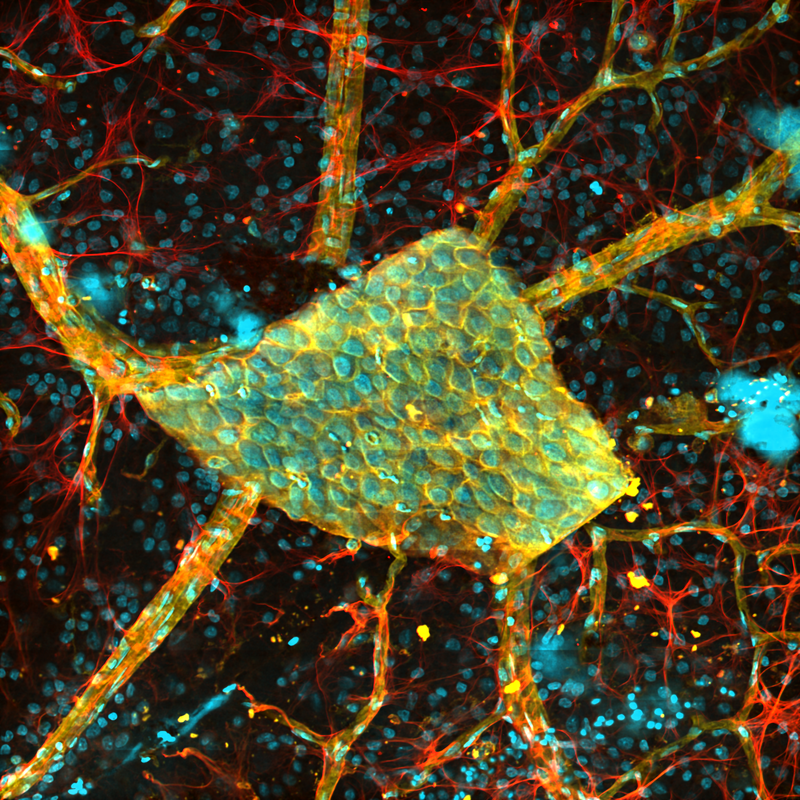 In addition, through ThorSync™, external camera data may be synchronized with microscopy image data to correlate image features with specimen behavior. ThorImageLS supports both standard and fast sequential imaging by coordinating and precisely timing the actions of the microscope with the laser source. 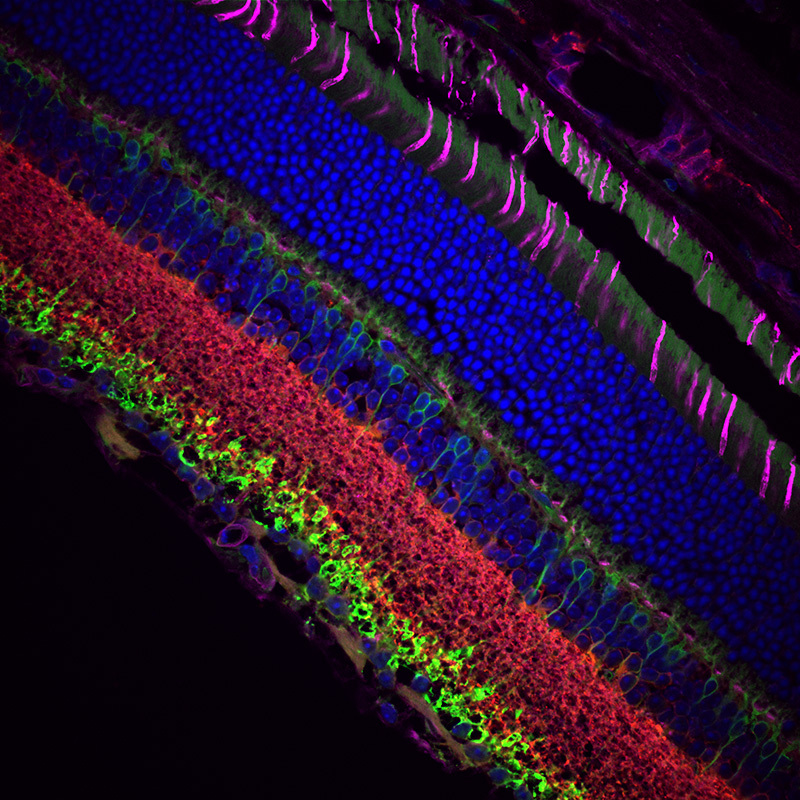 Using our multi-channel confocal system, wavelengths may be easily switched to acquire co-registered images and image stacks. Multiphoton imaging using multiple channels is possible at high speeds using our TIBERIUS® femtosecond Ti:Sapphire laser with a high signal-to-noise ratio (SNR) and low cross-talk between channels (see the image to the right as an example). 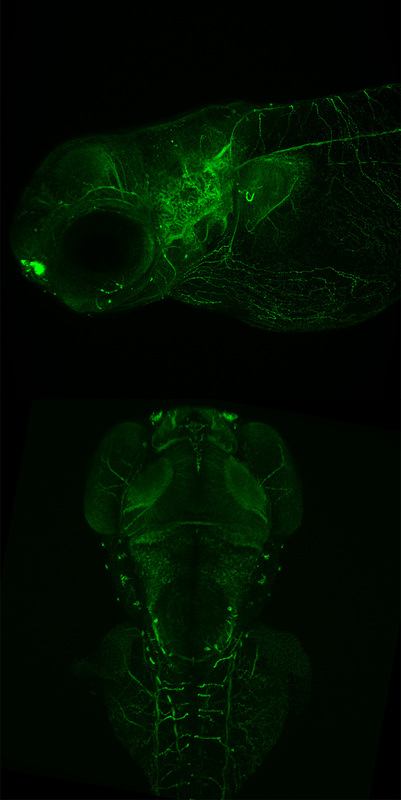 Light activation for optogenetics and protein uncaging using ThorImageLS can be performed in a number of ways, depending upon the equipment used. Our spatial light modulator, available for Bergamo® II systems, can be directly controlled by ThorImageLS to activate hundreds of regions of interest (ROIs) simultaneously, individually, or in groups. 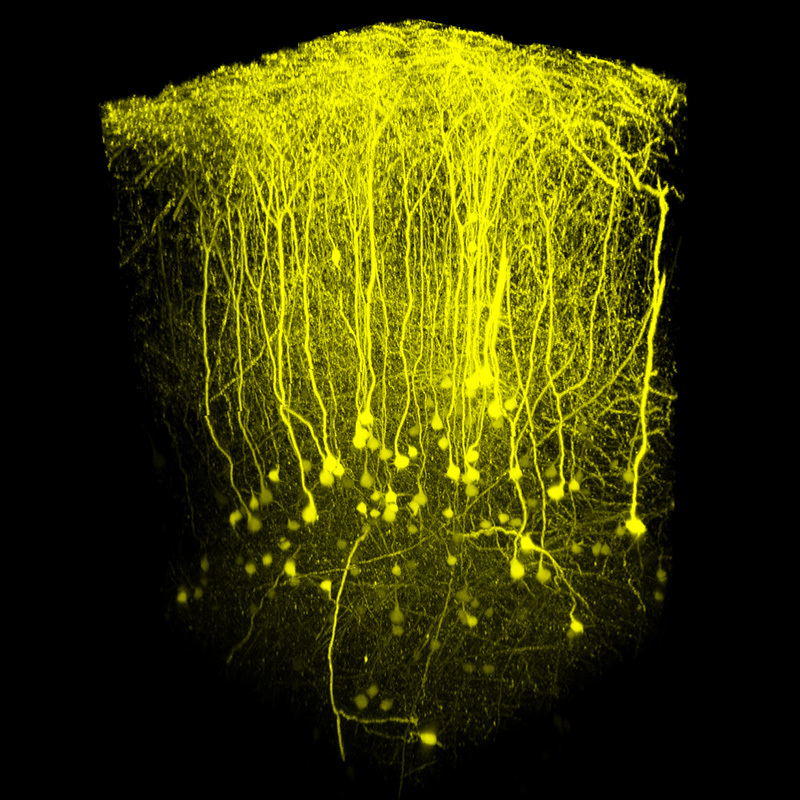 The image to the right utilized our software to identify and stimulate 100 neurons simultaneously within the microscope's field of view. Galvo-galvo scanners can be used for the serial stimulation of thousands of ROIs. The galvo scan pattern and ROI type can be specified to reliably stimulate entire cell bodies. This activation is tightly synchronized with image acquisition to maximize the lifetime of sensitive PMTs. Full-field stimulation is available using either an LED or a laser source. Stimulation can be timed before or after image acquisition, or between individual frames. Laser scanning microscopy with galvo-resonant scanners suffers from nonlinear laser dwell times, particularly at the edges of the scanning field. ThorImageLS can control pockels cells, available for Bergamo II systems, to blank edges and mask ROIs at high speed in order to improve laser excitation uniformity across regions of interest and prevent unnecessary exposure to areas outside of those regions. Regions are identified by a simple drag-and-drop across the live image. Image sets can be acquired at up to 400 fps and are only constrained in storage by the size of available hard drive space. Volumetric imaging synchronizes the fast z piezo travel of the microscope with data collection, ensuring accurate scans at user-defined steps. Our real-time ROI analysis can be used mid-acquisition on the acquired or streaming image set at video frame rates, reducing down time for sensitive in vivo experiments. ThorImageLS can tune the operation of supplemental hardware to more effectively acquire deep, high-speed 3D image stacks. The long-travel stepper motor and the high-precision piezo motor can be coordinated in order to traverse large z ranges at user-defined step sizes. Depth-dependent scatter through tissue can be compensated for by ramping the laser power as a function of depth, resulting in an even signal response throughout the scan. For Bergamo II systems that incorporate a variable beam expander, the laser beam diameter can be directly controlled by ThorImageLS to overfill the microscope objective for higher surface resolution or underfill for deeper penetration of light into the sample. When a single image scan does not provide sufficient resolution to view the area of interest, the sample plane can be imaged as a series of tiles, which are then stitched together in the software as a single high-resolution composite image. Configure tile position, size, and overlap for different samples, and enable tilt adjustment to correct for samples non-orthogonal to the objective. This functionality is compatible with both time series image sets and 3D image stacks. ThorSync monitors and stores digital and analog signals at rates up to 2 MHz. A software add-on designed to work in concert with ThorImage®LS, it coordinates and synchronizes the microscope's data acquisition with supplementary hardware and processes. Like ThorImageLS, ThorSync application code is available for complete software customization. This software package outputs arbitrary digital waveforms for initiating and coordinating experimental activities, such as photoactivation/photostimulation. Using the same base clock, analog and digital samples are stored simultaneously and stored to the computer's hard drive. There are up to 16 analog input channels (AI) and 32 digital TTL input channels (DI) available for sampling. Analog samples have a 16 bit resolution across a +/-10V range. Digital output signals (DO) for light and shutter control can refresh at up to 2 MHz. The software utilizes a PCIe-based DAQ that is installed and configured in the microscope’s main PC. During and after data acquisition, ThorSync stores detailed waveform information visible to the user. Rollover statistics provide real-time information for all signals, and user-chosen location indicators can measure the time and y-axis values for each waveform. As with ThorImageLS, acquired datasets are only limited in size by the hard drive selected for storage. ThorSync data is stored in a non-proprietary HDF5 format that is easily imported into most data analysis packages. 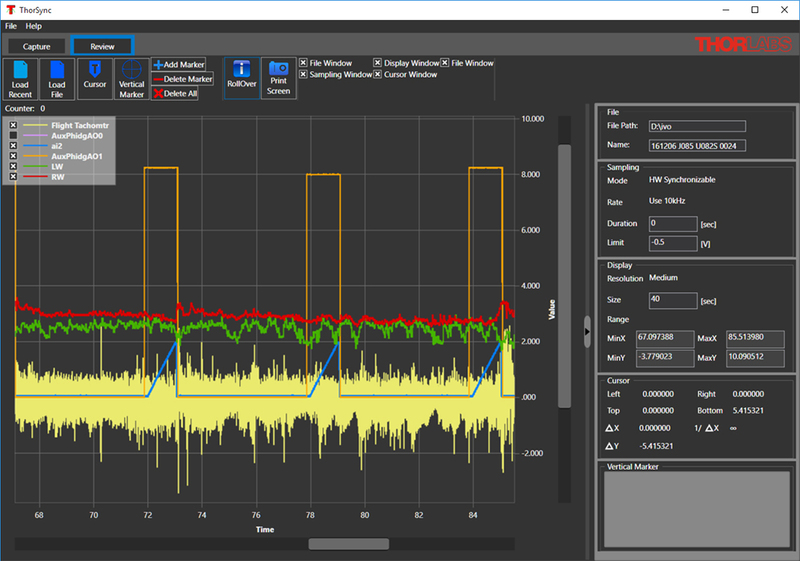 ThorImageLS has a variety of methods to automate data acquisition and analysis, either solely using ThorImageLS or in concert with third-party software and code. Sequences of capture setups and commands can be dragged and dropped directly into a scripting composition area. No programming knowledge is needed for this interface. In addition, ImageJ macros and MATLAB scripts can be executed directly from the script area in tandem with script commands. Scripts may be exported as XML files to share across different users and workstations. Our software has simplified automated acquisition and analysis using MATLAB and Fiji/ImageJ. Acquired data sets may be opened directly into MATLAB or Fiji/ImageJ using a quick connect button in the ThorImageLS software. 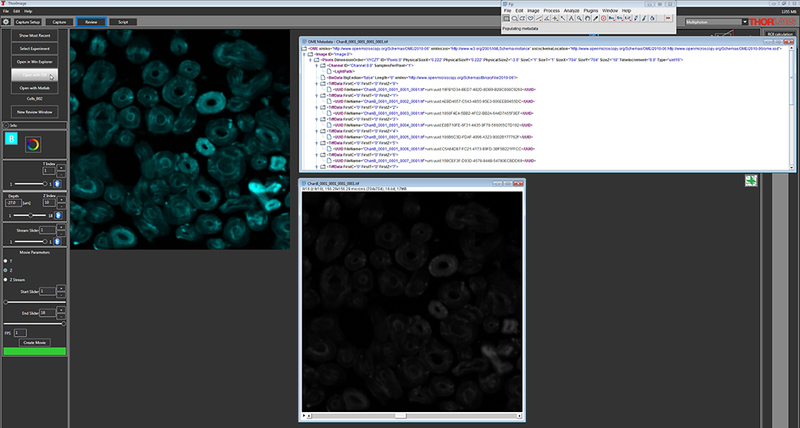 The software can also directly run MATLAB scripts and Fiji/ImageJ macros. Images and supplementary data are saved in non-proprietary file formats for easy integration with other software. Images may be stored as 16-bit TIFF or RAW files, with calibration values stored in the metadata. Supplemental instrument and experiment settings are stored in XML format. ThorSync and ROI statistics data are stored in HDF5 format. ThorImageLS has open SDKs available for users to code their own device plugins. Contact us using the Open-Source tab for access to these SDKs as well as the full software code. To serve the needs of the scientific community, ThorImageLS and the add-on ThorSync are open source and included with compatible Thorlabs microscope systems. Written in Microsoft C# and C++, they can be fully customized to individual needs. We also provide free lifetime technical support for our software. Contact us below for additional information and GitLab access to download the latest ThorImageLS (version 3.1) and ThorSync software source code. Feature suggestions and bug reports are also welcome. Please note that, because ThorImageLS versions 3.0 and later add significant new features over 2.x and 1.x versions, versions 3.0 and later may not be compatible with all older microscopes. We continue to support older software versions for customers with older hardware. As an example of code integrated with ThorImageLS and ThorSync, enabled by our open source code availability, please see the user-developed ThorViewer GUI. To explore automating the operation of ThorImageLS through scripts or 3rd party software, such as MATLAB or ImageJ, see the Interoperability tab. A representative will be in contact with you regarding your needs. Schnell B, Ros IG, and Dickinson MH. 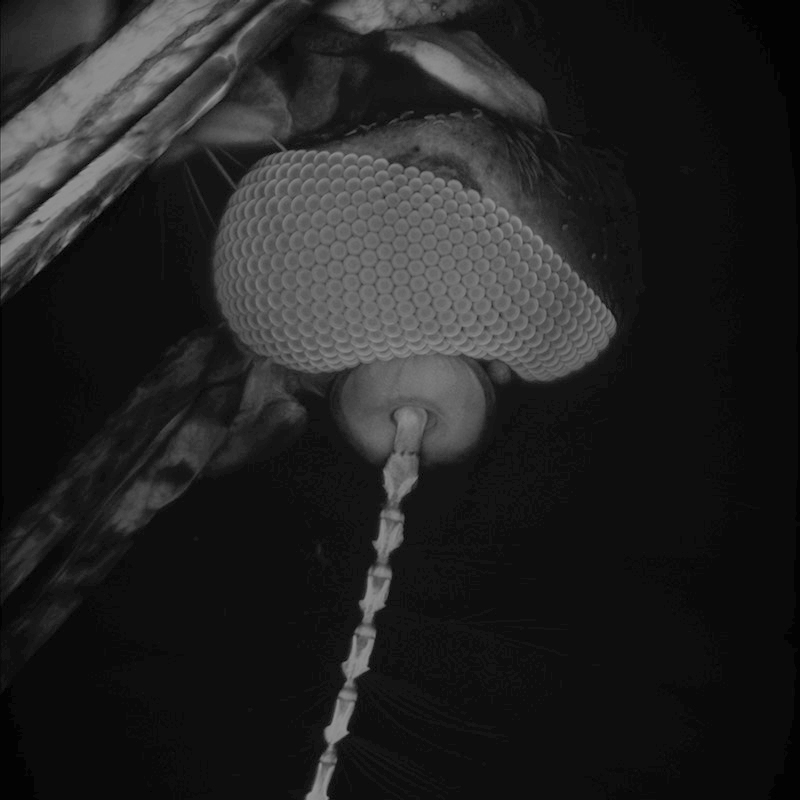 "A Descending Neuron Correlated with the Rapid Steering Maneuvers of Flying Drosophila." Current Biology. 2017 Apr 24; 27 (8): 1200-1205. Strobl MJ, Freeman D, Patel J, Poulsen R, Wendler CC, Rivkees SA, and Coleman JE. "Opposing Effects of Maternal Hypo- and Hyperthyroidism on the Stability of Thalamocortical Synapses in the Visual Cortex of Adult Offspring." Cereb Cortex. 2017 May 1, 27 (5): 3015-3027. Toni LD, Garoll A, Menegazzo M, Magagna S, Nisio AD, Šabovic I, Rocca MS, Scattolini V, Filippi A, and Foresta C. "Heat Sensing Receptor TRPV1 Is a Mediator of Thermotaxis in Human Spermatozoa." PLoS One. 2016 Dec 16; 11 (12): e0167622. Scattolini V, Luni C, Zambon A, Galvanin S, Gagliano O, Ciubotaru CD, Avogaro A, Mammano F, Elvassore N, and Fadini GP. "Simvastatin Rapidly and Reversibly Inhibits Insulin Secretion in Intact Single-Islet Cultures." Diabetes Ther. 2016 Nov 9; 7 (4): 679-693. 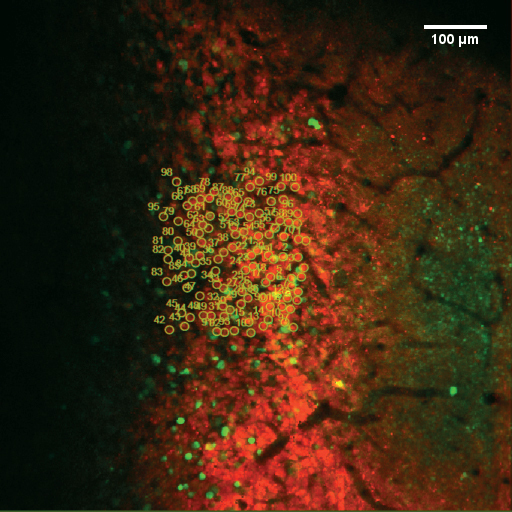 Lewin AE, Vicini S, Richardson J, Dretchen KL, Gillis RA, and Sahibzada N. "Optogenetic and pharmacological evidence that somatostatin-GABA neurons are important regulators of parasympathetic outflow to the stomach." J Physiol. 2016 May 15; 594 (10): 2661-2679. Zuo S, Hughes M, and Yang GZ. "Novel Balloon Surface Scanning Device for Intraoperative Breast Endomicroscopy." Ann. Biomed. Eng. 2016 Jul; 44 (7): 2313-2326. Jia Y, Zhang S, Miao L, Wang J, Jin Z, Gu B, Duan Z, Zhao Z, Ma S, Zhang W, and Li Z. "Activation of platelet protease-activated receptor-1 induces epithelial-mesenchymal transition and chemotaxis of colon cancer cell line SW620." Oncol Rep. 2015 Jun; 33 (6): 2681-2688. Lu W, Tang Y, Zhang Z, Zhang X, Yao Y, Fu C, Wang X, and Ma G. "Inhibiting the mobilization of Ly6Chigh monocytes after acute myocardial infarction enhances the efficiency of mesenchymal stromal cell transplantation and curbs myocardial remodeling." Am J Transl Res. 2015 Mar 15; 7 (3): 587-597. Lang X, Spousta M, Hwang YJ, and Lyubovitsky JG. "Noninvasive imaging of embryonic stem cell cultures by multiphoton microscopy reveals the significance of collagen hydrogel preparation parameters." Analytical Methods. 2015 10 Nov; 8: 280-294. Dechen K, Richards CD, Lye JC, Hwang JE, and Burke R. "Compartmentalized zinc deficiency and toxicities caused by ZnT and Zip gene over expression result in specific phenotypes in Drosophila." Intl. J. Biochem. Cell Biol. 2015 Mar; 60: 23-33. Partridge JG, Lewin AE, Yasko JR, and Vicini S. "Contrasting actions of group I metabotropic glutamate receptors in distinct mouse striatal neurones." J Physiol. 2014 Jul 1; 592 (Pt 13): 2721-2733. Qin X, Qiu C, and Zhao L. "Maslinic acid protects vascular smooth muscle cells from oxidative stress through Akt/Nrf2/HO-1 pathway." Mol. & Cell. Biochem. 2014 Feb 20; 390 (1-2): 61-67. Lang X and Lyubovitsky JG. "Structural dependency of collagen fibers on ion types revealed by in situ second harmonic generation (SHG) imaging method." Analytical Methods. 2014 Nov 13; 7: 1680-1690. Poguzhelskaya E, Artamonov D, Bolshakova A, Vlasova O, Bezprozvanny I. 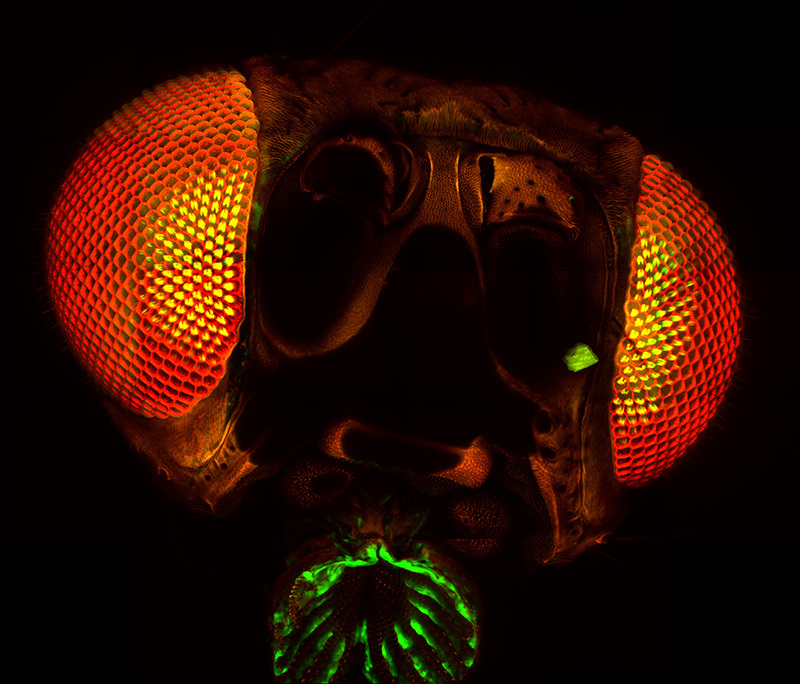 "Simplified method to perform CLARITY imaging." Mol. Neurodegener. 2014 May 26; 26: 19. Liu J, Wu N, Ma L, Liu M, Liu G, Zhan Y, Lin X. "Oleanolic Acid Suppresses Aerobic Glycolysis in Cancer Cells by Switching Pyruvate Kinase Type M Isoforms." PLoS One. 2014 Mar 13; 9 (3): e91606. Xiang H, Cuifang K, Zhaotai G, Shuai L, Yanghui L, Xu Liu. 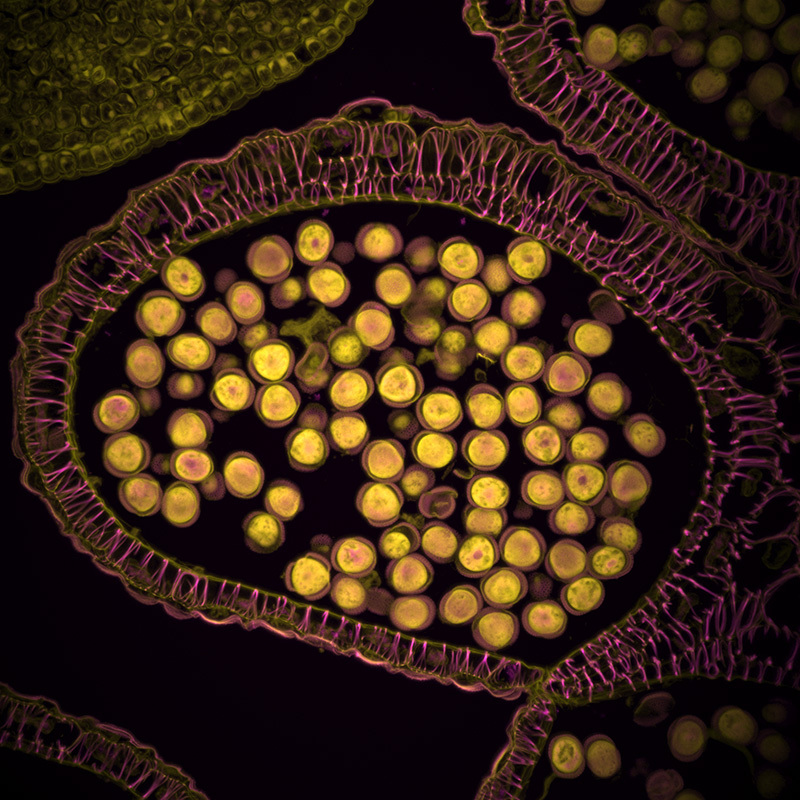 "Contrast reversal confocal microscopy." Optics Comm. 2013 Jul 1; 298-299: 272-275. Brown CM, Melcher JT, and Stranick SJ. "Scan Linearization for Resonant Optomechanical Systems." Imaging & Appl. Optics. 2014; IM1C.3. 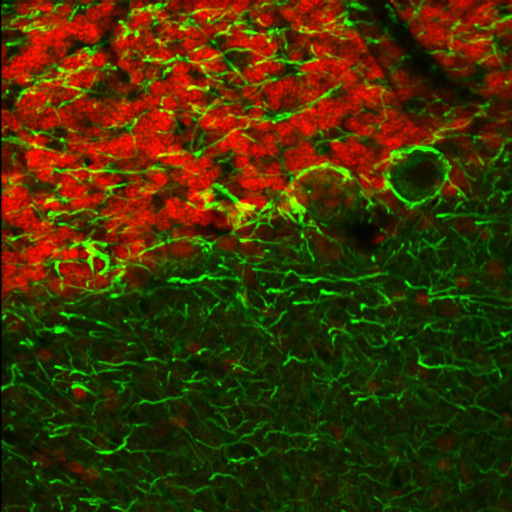 Lalchandani RR, van der Goes MS, Partridge JG, Vicini S. "Dopamine D2 receptors regulate collateral inhibition between striatal medium spiny neurons." J. Neurosci. 2013 Aug 28; 33 (35): 14075-14086. Click the links in the table below to be directed to updates and changes concerning the newest and previous versions of ThorImageLS. Added 100% Button to Image Review. Resizes Image to Full Size. Thank you for contacting Thorlabs. At the moment our Thorimage software is only available when included with one of our imaging systems and we do not have a version of the Thorimage software to download separately for DIY projects. Access to the open source project is limited to existing customers looking to customize Thorimage to their needs with Thorlabs microscope. The scanning parts Thorimage is not open source and cannot be customized to function with other scanners and digitizing hardware. If you currently have one of our microscope systems and need a system software reinstall or update please contact us at imagingtechsupport@thorlabs.com.